I'm not sure how many books I can read before June 30th, I wish I knew where my Lisa Jackson books were! I may need to overlap with my "Support Your Local Library" challenge with this one. It will be announced later on this afternoon, but your name was pulled from the raffle bucket. If you'd send your shipping info to: jkayeoldner@yahoo.com, I'll get your prize out to you. 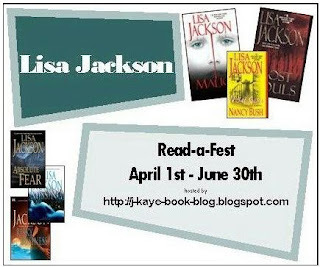 Yesterday was the last day to get your Lisa Jackson books completed for the Read-A-Fest. There is a post to link your wrap up post. You can find it here.